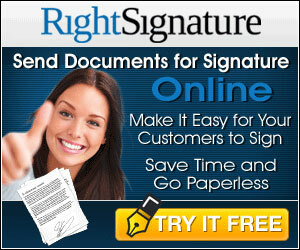 RightSignature is the easiest and fastest way to get documents signed. It’s trusted by small businesses and the world’s largest companies. Contracts, NDAs, forms, anything that you need a signature can all be signed online in minutes. RightSignature is super easy to use. Just upload your documents, sign online via fax or online mobile device and then it’s archived as a legally binding document stored online for you. Impress your customers, save time, money and paper and have legally binding agreements in minutes. Try it now for FREE with no obligations.